Ceilings leaks are a nightmare to many homeowners because it is not easy to identify the source of the problem. This is because the brown color on the ceiling is usually the last sign to show that there has been a water leak problem within the building. If you are living in flats or have toilets and bathrooms upstairs, you are likely to experience ceiling leaks. Especially if the toilets and bathrooms lack a good drainage system. If you find wet surfaces on your ceiling, you can contact Waterproof Singapore professionals for solutions. The presence of wet stains on the ceilings. This might be a sign that the roof is leaking rain water which is finding its way to the ceiling. Some people consider applying a new paint to remove the brown color that appears on the ceiling after the water has dried. However, after a while, the discoloration will occur again because the problem was not solved. The following are types of ceiling stains that can easily show you that there is a ceiling leak in your house. This is a common sign for most homeowners in Singapore because it is caused by the presence of the exhaust fan. Moisture content is likely to be trapped in the fan which causes the brown color over time. Therefore, you will need specialists to check the exhaust fan and fix the problem. The main cause of this problem is the condensation of moisture and air which eventually leads to water molecules accumulation. Most plumbing pipes are usually joined at the corners of the house. They form the weakest point of the system because they are vulnerable to tear and wear, and extreme water pressure. 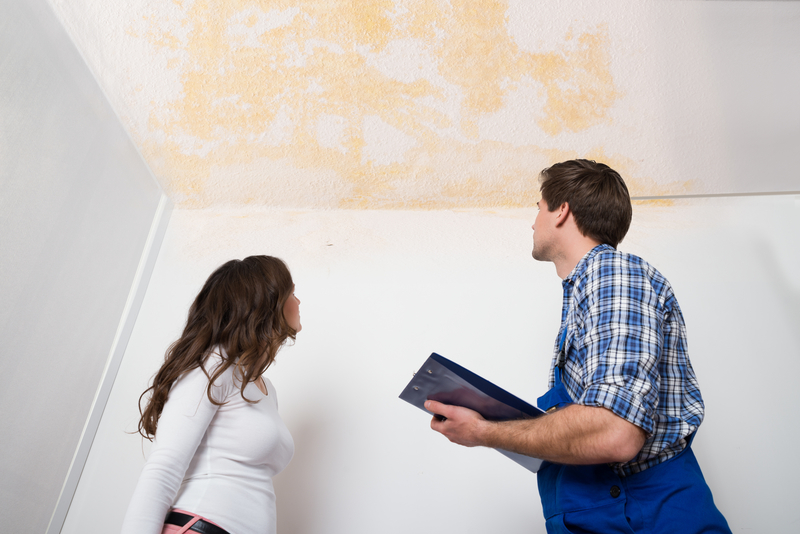 When stains appear at the corners of the ceiling, it could be because of the plumbing system or ice dams. Due to the weather conditions in Singapore, an ice dam is not very common. The roof stains can become more if the roof is leaking. Especially during the rainy season, the stains can become more because of the roof seepage. If the roof does not have a good waterproof membrane, you are likely to experience more ceiling leaks. You will need a specialist who can fix the roof leaking problem and then replace your roof. Plumbing system fault is one of the common sources of ceiling leaks in a building. This is because the pipes are actively carrying water to the building. If it fractures, it affects the ceiling as well as walls in your house. Continuous water leaks will destroy your ceiling. The moment you notice small patches of wetness on your ceiling, call Waterproofing Singapore professionals. A specialist will be able to find the cause of the ceiling and fix it. Replacing your ceiling with a new one is not a solution to the leaking problem. You need a professional to investigate the source of the leak, fix the problem then replace your ceiling. If the repair is not done correctly, you will still experience ceiling leak. Our repair services usually come with a warranty. We will offer you after service visits to check if the problem was fixed. These services are usually free of charge. Hiring experts for a ceiling leakage repair add value to you home. Most home buyers do not prefer buying houses that have been fixed using the DIY methods. This is because it is not guaranteed if the services were correctly done. Professionals like Waterproofing Singapore have the best solutions to the ceiling leak problem. Therefore, you will receive the best services that are long term and effective. This will give you peace because you are assured of quality and durable ceiling leakage repair services. Sometimes the root cause could be a worn out waterproof membrane. A specialist will be able to recommend the best waterproof membrane to fix the problem. An old waterproof membrane might have torn, allowing water to pass through to the ceiling. Contact us today for the best ceiling leakage repair quotation.